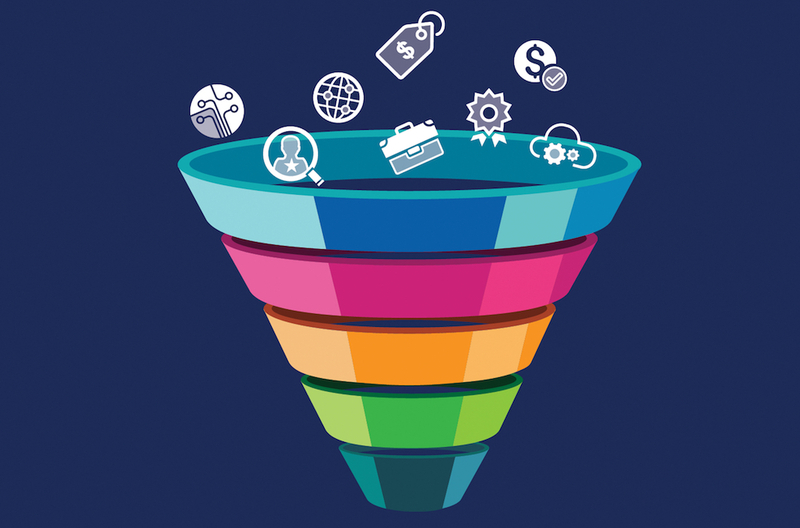 A sales funnel, sometimes referred to as a marketing, purchase or revenue funnel, is a graphic illustration of the overall journey that a prospect goes through before finally becoming a customer. Its shape isn’t accidental, though. While the word “sales” clearly indicates the nature of this process, “funnel” represents the sales principle in general. Regardless of offer or niche, each sale begins with many potential customers at the top, necks down as it loses leads and concludes at the narrow bottom, where the purchase is finally made. By rule, the number of those who enter the sales funnel is way larger than the number of those who eventually convert into customers. Though this ratio cannot be changed, entrepreneurs can employ a series of different tactics for making their funnel less leaky. Its sturdiness is directly related to the effectiveness of your lead generation and nurturing strategies, whilst customer conversion and retention play an equally important role. As long as you include these fundamental stages, you can feel free to design your sales funnel any way you want. It’s important to note that the last stage of the sales funnel is not the last phase of the customer lifecycle. In order to retain buyers, build long-lasting relationships and turn them into brand ambassadors, you need to develop a solid customer retention strategy as well. For the reasons mentioned above, a good sales funnel is always created with customer lifecycle in mind. Irretrievably intertwined, these two principles can significantly increase your sales only when developed and applied together. The first stage in a sales funnel is called “awareness”, because it refers to prospects who still haven’t made any touch points with your company’s brand. As leads, they need to be generated and attracted with marketing campaigns. Once captured, they become interested in your products and services, thus graduating into high quality leads and moving one step closer to the bottom of the sales funnel. Lead nurturing tactics take place right here, in between two stages called “interest” and “decision”. At this point, you need to delight your prospects and provide all the information they need to make up their mind. If persuaded, they take action and convert into paying customers. Even though their journey through your sales funnel ends here, you need to make sure that they come back and stick with your products and services for a longer time in the future. This is made possible through customer retention, which is the last and ongoing phase of the customer lifecycle. There are four sales funnel stages that separate prospects from customers, and each of them determines whether they stick around or bounce. Here are the characteristics of each stage and tactics to ensure a smooth transition from one to another. We might as well call this stage “epiphany”, since it’s when a prospect becomes aware of the problem that needs to be solved. Searching for a resolution, he or she stumbles upon one of your ads or social media campaigns. Your marketing leads them straight to your website, where they finally become familiar with the products and services your company offers. This stage is all about brand awareness, which you can raise through content marketing, social media posts, paid advertisements and SEO-empowered blogs. Keep your baits captivating and informational, and prospects will surely be interested in finding out more. At this point, prospects begin to show interest in your products and services. Potential clients browse your website, contact your customer service reps and ask questions. It’s a perfect opportunity to lure them in with your content and nudge into subscribing to your email list and following you on social media. At the interest stage, the number of prospects starts to gradually decline, but chances for converting those that remain interested reciprocally increase. Your primary tool for this stage is your landing page – when equipped with a compelling subscription form, it ensures the first formal touch point between prospects and your brand. Once attracted, your leads should be nurtured with email newsletters, eBooks and other educational content that helps them choose your products and services instead of your competitors’. In case you detect a website visitor who hasn’t subscribed, drive them back with retargeting tactics. Finally, it’s decision time. Here is when prospects seek further information about your offer and need to be convinced that it’s the best possible solution they can find. They’ll want to know more about your packages and price plans, but they’ll start comparing them with your competitors’ offers as well. Decision making is the last step toward an actual purchase, so it’s crucial that you stay vigilant but firm. If the nature of your product allows it, offer free demos and trial versions. It’s an effective way of showing your strengths and enabling prospects to experience your offer first-hand. If not, you’ll have to make your product pages as engaging as possible. In addition to social proof, security badges and trust signs, offer free consultation and promotions as well. After the decision has been made, the prospect finally converts into a paying customer. This stage is the very bottom of your sales funnel, from which you should proceed with customer retention tactics. However, this doesn’t mean that prospects cannot change their mind before they complete a purchase. To avoid cart abandonment, make sure that your call to action is impossible to overlook and resist, offer free shipping and a variety of payment options, eliminate all surprises and make the process swift and smooth. The road from awareness to action is long and bumpy, which is why successful businesses should depend on both marketing and sales to guide prospects through the sales funnel. Employ the best strategies, consult metrics and analytics at the beginning of each stage and stay dedicated to your customers – eventually, they will return the favor by offering their loyalty. Bitrix24 is a free sales automation and sales team management solution. It’s not just CRM and lead management software, with Bitrix24 you can create e-mail marketing campaigns and custom workflows, collaborate and do much more. Use promo code TIP10 when registering your free Bitrix24 account to get extra 10GB.